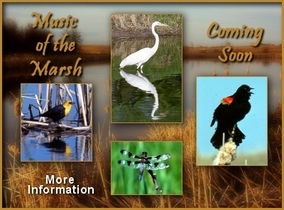 Currently in the works is a documentary I've been working on for several years, called Music of the Marsh. It is a two part series that features many of the creatures that inhabit the marsh. Part one is: A Symphony of Wings - Ducks, Geese and Swans. Part two is: An Ancient Ensemble - Herons, Egrets, Songbirds, Frogs, Turtles, Muskrats, Mink, Raccoon, Marsh Hawks, Soras, Dragonflies, marsh flora and more. Coming Soon: Click here for more information. The Return of the Wood Duck is a conservation story highlighting perhaps the most beautiful duck in the world, the American Wood Duck. The film chronicles the history of this unique American species through native references, art, literature and ancient artifacts. Weaved around the story of the Wood Duck's sudden decline, response to decline and eventual recovery is the history of the conservation movement in America. Witness close-up the pair bond, courtship, feeding and nesting of a pair of Wood Ducks. The peak of the life- cycle (leap of life) is the jumping from the nest of the day-old ducklings. A section on conservation and ethical hunting demonstrates how sportsmen and conservationists can work together, as did John Muir and Teddy Roosevelt, to save what is left for future generations. The film includes appearances by experts Frank Bellrose and Art Hawkins with music by Jerry Read Smith and narration by Tony Dean. The film was produced and written by Boz Metzdorf with sound and video editing by Aaron Carper. 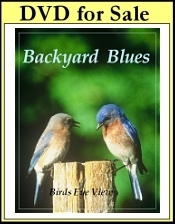 BACKYARD BLUES is a heartwarming story of a pair of bluebirds who raise a family right in the backyard. Springtime, happiness, devotion and plaintive song are just a few of the images evoked when referring to the beautiful Eastern Bluebird. Here we see that if the habitat is suitable and predators are controlled, this celebrated bird of American folklore and song can be coaxed to nest in your backyard. There are examples of broods being cared for just a few yards from the kitchen window. Witness close-up, scenes not normally observed on a bluebird trail, such as bluebirds at the window feeder, babies fledging from the nest and juveniles frolicking at the birdbath. Few wild creatures are as amicable and tolerant toward man as the colorful bluebird who brings cheer to our homes and brightens our yards and gardens with its' enchanting song. Discover the secret lives of birds that use bird houses. See close-up, a birds-eye-view of what goes on inside the nest box. Follow the courtyship, nesting and family life of chickadees, nuthatches, swallows, wrens, flycatchers, owls and woodpeckers. 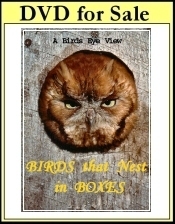 Includes a brief history of bird houses in America and a look at the current status and threat to cavity nesting species. Here you will see and hear many of the most common birds of North America as they perform their extraordinary rituals through each season of the year. See close-up, birds courting, mating, nesting, eating, drinking, bathing, calling and singing. Learn to identify their habits, plumage, songs and calls. From the arrival in spring of the first oriole with its' brilliant plumage, to the scarlet flash of the cardinal as it brightens a bleak winter landscape, we see the change of seasons from a birds eye view. 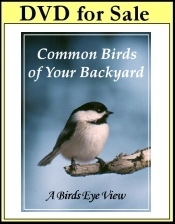 Whether it's the friendly manner of the chipping sparrow or the cheerful antics of the chickadee, birds fill our backyards with an array of intense activety and provide us with many hours of enjoyment and fascination. Birds Eye View Productions was established In 1988 when Boz and his wife Kate began marketing to schools, libraries, DNR, Fish and Wildlife agencies, Audubon chapters, nature clubs, sports clubs and individuals. Boz's more recent work includes Return of The Wood Duck , a conservation success story documenting the comeback from near extinction in 1900 to its' present day healthy status. The film has been has recently been broadcast on Public Television throughout the midwest United States. In development currently is Music of the Marsh, a story of the creatures that inhabit our shrinking wetlands. Boz has composed and recorded original music for some of his films, including The Oliver Charley Story and Shades of Blue which is the soundtrack for the DVD Backyard Blues. The musical score for Music of the Marsh is complete and now being recorded.